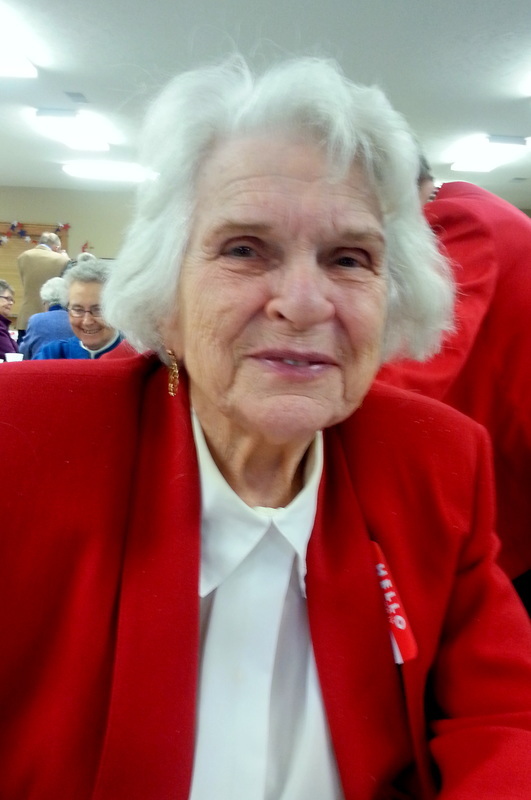 From Sharla Cerra: In February 2016, I sat with Evelyn at a District Convention for the American Legion Auxiliary. During the day, she shared a few memories with me. She is 87. "My mom lived to be 95," she says. "I feel good. I think I'll live to be 100." She looks great, walks with the grace of a young woman. She may! She was born in 1928 at the McCrea Hospital in Table Rock. Dr. McCrea delivered her. Her parents were Libby & Ed Kalina; she had a sister, JoAnne, and a brother, Arnold. They lived in in the country, south of Table Rock. She went to District 32 country school, the old stone school. She left Table Rock in 1954; she and her husband moved to Barneston, where they raised their kids. She has four kids (Gordon, Ginger [Nicholaus], Roger, and Dell), 23 grandchildren, and “6 or 7” great grandchildren. McCrea Hospital, Photo 438, undated. 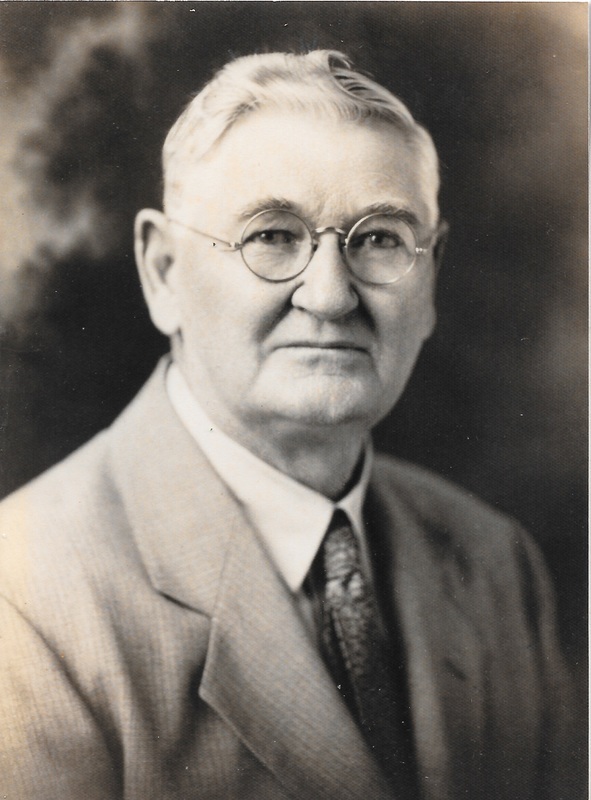 Dr. Ed McCrea, who delivered Evelyn. Photo 1259. District 32 country school, where Evelyn when to grade school. Photo 481, undated. 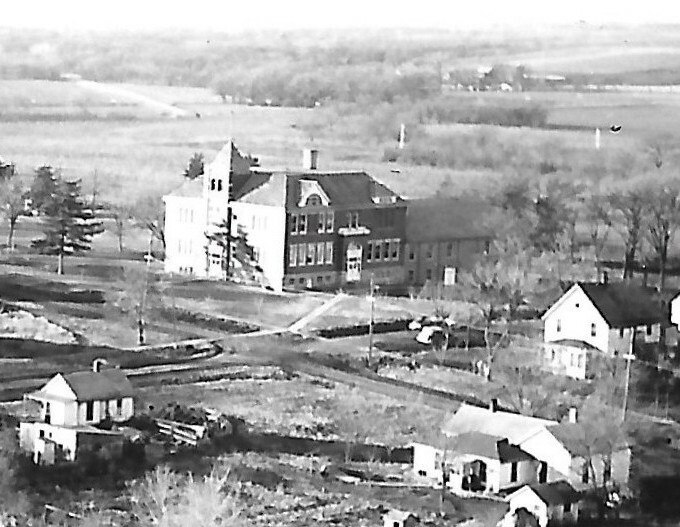 Table Rock School in 1941, a detail from a photo taken by Arvid Blecha in 1941, Photo 2306. Evelyn graduated in 1944. ​Evelyn remembered going up the hill to Grandma Kalina's house. "We'd eat at home, and then my brother and I would go up the hill to grandma Kalina's. My brother would tell her he was hungry. And we just ate! He'd tell her that anyway! Grandma would say, in Czech, "but the bread is sleeping." Then she would feed us anyway! From what Evelyn told me, I believe this is a photo of the family up the hill from when Evelyn's father Ed was a kid -- he's the little guy third from the right. The photo has a tag on it: “The Joseph Kalina farm southeast of Table Rock. Left side of this house was an original log house. Anna (Pochaska) and Antonia (Reiman), Eddie, father Josef, mother Karolina, and grandmother Pavlas." Evelyn's grandma Kalina, years after this picture was taken, was presumably Karolina. 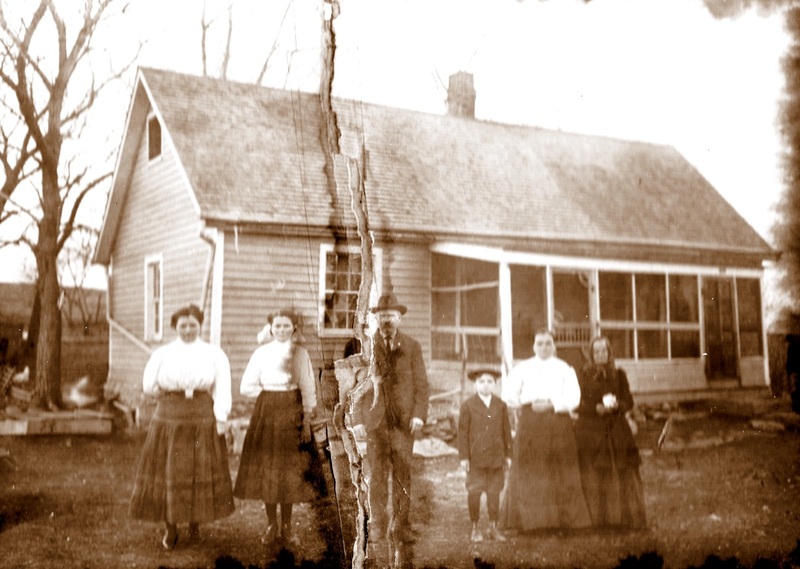 Evelyn says that years later her father went to tear the house down and discovered there was a log cabin within the walls. He already had the roof off by then so couldn't stop. Evelyn was older than Arnold, who apparently was a typical little brother. My mom worked in the fields. I kept the house clean. My brother messed it up. One time, I locked him out. He insisted on getting back in to mess it up, and started up using a hammer on the door. I thought I was going to get in trouble when Mom got home, for locking it out. It was him, though. She was a Findy, and they lived in Tate, Nebraska. She lived with an uncle, but his wife was cruel to her. She was allowed little food at home. At school, the kids would all pitch in and share their food with her. But then her cousins would go home and tell their mom that Libby got good food, and then the aunt would give Mom a beating. She was not allowed to eat at the table with the family; the seat of a chair was her table. One day the Rudy Fliders came and got her. I don't know how they knew of her or her situation, they just came and got her. When they got to Table Rock, they asked her, “Do you know where you are?” Mom couldn’t see much, was probably scared about looking out, or something. Anyway, her response was “I'm in a car.” They did not adopt her, but they raised her as their own child and were always very good to her. Tate was in Pawnee County; it no longer exists. It was founded in 1891 and “discontinued” in 1920 after the railroad stopped coming through. The peak population was 100 in 1900. 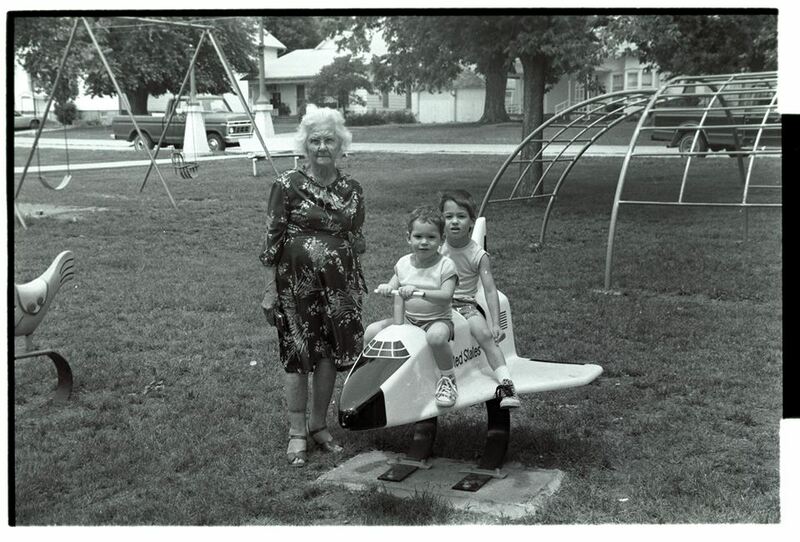 Evelyn's mother Libby with Casey & Spenser Sandusky, undated. Evelyn liked Dr. McCrea. "He was always nice," she says. However, she went to him only once for a sore throat. Doctor and "Mother" McCrea ("Mother" is what he called his wife, as did everyone else.) This was taken in 1941, when Evelyn was in high school, by Arvid Blecha. About the time they moved to town, my dad started working with wood. He made some beautiful things. An oak roll top desk. A chest. Many pieces of furniture, many beautiful things. He got wood from the Sitzman sawmill sometimes. He would take a log of something special down there and have it sawed up. He loved beautiful wood. He said if you're going to make it, then make it out of something nice. The Table Rock Historical Society was founded in 1965. Ed & Libby were charter members. Ed was on the first Board of Directors. ​Both did a lot of work over the years. Some of Ed's projects are in the museums, including two amazing sets of carved horses pulling wagons. 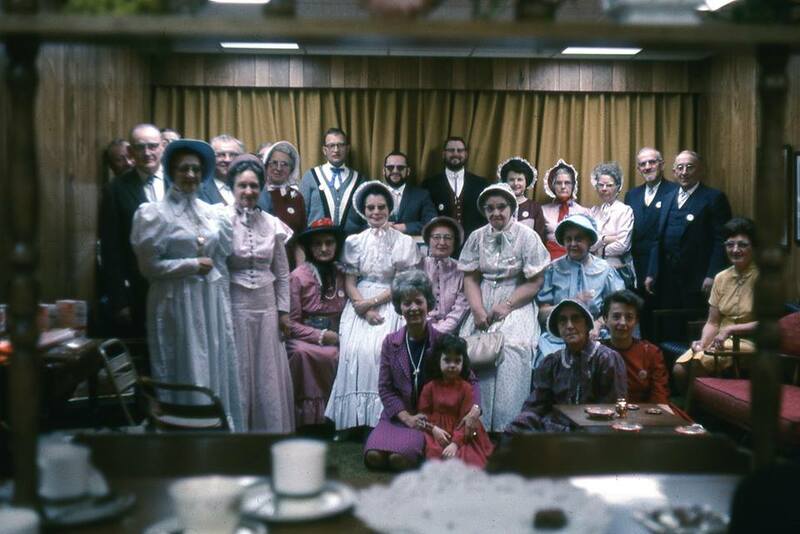 ​In 1967, for the Nebraska Centenniel, a group from the Table Rock Historical Society headed up to the television station. Ed and Libby and many another notable Historical Society member is in this picture.